Sovereign King, gentle Savior, I come to You in prayer today, completely at lost for words. You know my struggles and the battles I face daily. I feel so drained, tired and weak. Be my strength, Oh Father. Be my comfort in these treacherous times. The difficulties I am facing today baffles me. Yet, they cannot compare to the promise I have in You. 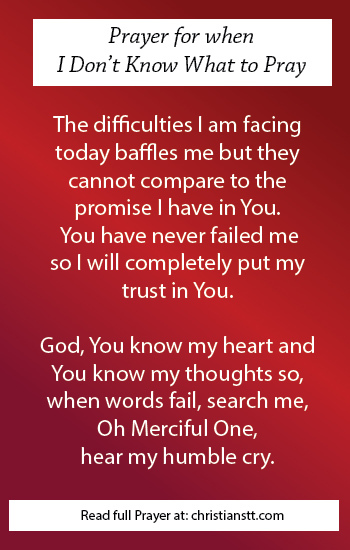 For You have never failed me and I will completely put my trust in You. God, You know my heart. You know my thoughts. So, when words fail, search me, Oh merciful one. Hear my humble cry. Grant me peace within my soul and heal and save me and make me whole. Yeshua, I cannot describe my feelings at this moment. I cannot explain what I am going through. But You know. You know how much I need You. You know how much I’ve been through and You know how much I cannot go on without You. Father, these words may fail but Your love never fails. It is an eternal, everlasting, undying, unconditional fire that burns forever. I will rest assured, knowing You hold me in the palm of Your tender hands. I pray that You will listen to the beat of my heart today, for words have surely failed. In Jesus’ mighty name I pray, Amen!